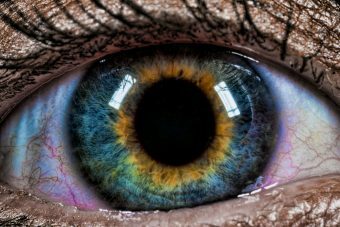 Blue and Green Pigments Don't Exist in the Human Iris, So How Do Some People Have Blue and Green Eyes? Blue and Green Pigments Don’t Exist in the Human Iris, So How Do Some People Have Blue and Green Eyes? Terran N. asks: Why do some people have different colored eyes? Eye color is a function of pigmentation both at the back of the iris (iris pigment epithelium) and in its stroma (the front of the iris), as well as the density of the cells in the stroma. In most cases these factors, and hence eye color, are determined by genetics with potentially as many as 15 different genes identified to date seeming to affect the ultimate coloring in some way. However, contrary to what you might think, blue and green pigment do not exist in the human ocular fluid or iris. In fact, only a couple of pigments are involved in eye color: melanin (brown) and lipchrome (yellow). Aside from potential extreme albinism cases, all eyes have some amount of melanin in the back of the iris, although not all eyes have lipochrome. For brown eyes, there is high concentration of melanin in the back of the iris as well as in its stroma. The result is the melanin absorbing both short and long wavelengths of light from across the visible spectrum, with the density of melanin in these two layers ultimately determine the shade of brown, which in extreme cases can appear near black. On top of the melanin, amber eyes get their color from the added presence of lipochrome in the stroma. As we said earlier, blue and green pigments do not play a role in human eye color. So how does anyone have blue or green eyes? Well, the remaining human eye colors, including blue and green, are in part a trick of the light. With blue eyes, there is a fair amount of melanin in the back of the iris, but relatively little melanin within the stroma, making it translucent, with light getting scattered around when it encounters this layer. This scattering occurs more at the shorter wavelengths of light, most relevant here being blue, while longer wavelengths are typically passed through and ultimately absorbed by the melanin at the back of the iris. The net result is the eye appearing blue, even though if you were to dissect the eye in question, you’d see the person physically had brown eyes. This same type of thing is more or less what’s happening in the sky when sunlight is scattered in the atmosphere, making it appear blue, even though if the light from the Sun was not being scattered or absorbed in the atmosphere, the sky would look similar to the way it does at night in the day time. Grey eyes work almost exactly like blue eyes, with a good amount of melanin at the back of the iris absorbing the longer wavelengths, but little within the stroma. The reason these people’s eyes don’t appear blue is thought to be due to larger deposits of collagen that cause a different kind of scattering that isn’t as frequency dependent. This type of scattering is basically what is happening when water droplets in clouds cause them to look some shade of grey. In contrast to blue and grey, green eyes have far less melanin at the back of the iris, so slightly less absorption; they also have some lipochrome in the stroma. As with blue and grey eyes, there is little melanin in the stroma and so a bit of light scattering helps impart a blue hue, the net result of all of this being the eye appearing some shade of green. Hazel eyes, which can shift from brown to green, have more melanin in the anterior (front) border layer of the eye, and, like green, grey and blue eyes, scatter certain wavelengths of light resulting in a somewhat shifting eye color. On that note, the fact that these latter hues are largely dependent on a trick of the eye, rather than, for instance, blue pigmentation, is why people with these eye colors sometimes appear to have a different eye color than they normally do. Nothing has actually changed physically in their eyes, but changing the lighting may end up changing the wavelengths and concentration of light getting scattered and absorbed, resulting in the appearance of, for instance, a normally slightly green eye looking slightly blue. Multiple eye colors can be caused by a variety of things from genetics to various medical conditions, such as Horner’s syndrome and Waardenburg syndrome. Regardless of the underlying cause, the individual in questions ends up with a non-uniform distribution of melanin in one or both eyes. In some cases, the individual might have two completely different colored eyes (complete heterochromia). Perhaps the most common cause of this is genetic. However, other phenomena can cause a single eye to completely change color, such as inflammation like that suffered by actress Mila Kunis, which changed the color of one of her eyes. External causes include topical medications used to treat glaucoma, potentially turning a blue eye to brown. Another variation of heterochromia occurs where at least one eye displays two different colors throughout, sometimes with an inner ring differing from the outer coloration (central heterochromia). Another type occurs where only a portion of one eye has a different color. As with more uniform eye coloring, in all cases the resulting eye color is largely a function of brown and yellow pigmentation and its distribution and density in the back of the iris and in its stroma. Can Color Blind People See More Colors When They Take Hallucinogenic Drugs? Why Does Hair Only Grow to a Certain Length? The Color Pink Doesn’t Exist? How does someone get two different colored eyes? What Wavelength Goes with What Color? What wavelengths of light are being absorbed by a brown object? 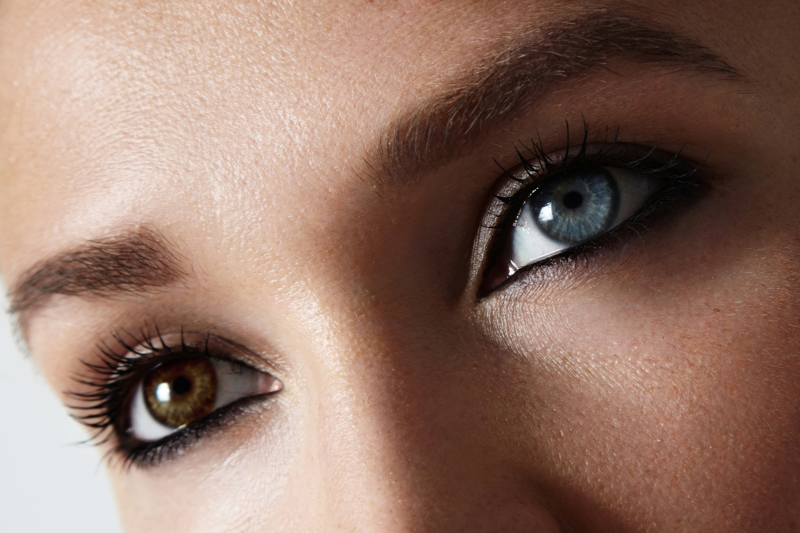 Why Do Some People Have Differently Colored Eyes? Knew a girl in high school who had yellow eyes. Quite freaky looking. Okay. So that would explain why my son and his father both have a never-changing shade of denim blue eyes, but doesn’t really help me understand why my blue eyes change from a steely grey-blue to a bright turquoise, depending on my mood. Has my reading comprehension failed me? Interesting. My wive’s eyes change to a deeper blue when shes had a few. I had never really considered a change in mood as the reason, but I guess ultimately it’s all down to chemistry. My son also has segments of brown in his otherwise blue eyes. Looks cool I think.